Discover more about the breakthrough technology of Cranial Electrotherapy Stimulation and the peace of mind, relaxation, and restful sleep that the CES Ultra brings to those who suffer from anxiety, depression, and insomnia. Below you can see a compilation of scientific studies on CES. The CES Ultra stands apart from all other devices, especially in the context of Meta-analyses. A Meta-analysis contrasts and combines the results from many different studies rather than relying on a single study to draw particular conclusions. Meta-analyses yielding positive results from the use of CES have been conducted at the University of Tulsa and at the Harvard University School of Public Health. The major meta-analysis of the Harvard School of Public Health, which found that CES has a statistically significant effect on alleviating anxiety, focused entirely on units using the configuration in the CES Ultra. Eighty-five percent of the independent research on the efficacy of CES is based on the configuration of the CES Ultra medical device. Other units on the market may have the same frequency, but they do not measure up to the amplitude, wavelength, duty cycle and frequency found only in the CES Ultra. That means that while other companies may cite research studies, those studies are often company-based and company-funded and hence are not truly independent and fully objective. Only the CES Ultra has the configuration that was used in independent, university-based studies. Depression is the state in which the individual feels sad, helpless, and disinterested in life. Clinical depression affects mood, mind, body, and behavior. Depression is the most frequently seen psychiatric disorder among both hospitalized inpatients and those in outpatient psychiatric care. Research has shown that in the United States about 19 million people-one in ten adults-experience depression each year, and nearly two-thirds do not get the help they need. P300 waves have a reduced amplitude in many alcoholics, which does not revert to normal, even after continued abstinence. 13 alcohol and/or drug abusers and 2 staff controls were selected as they entered the clinic for a computerized EEG. All were given 40 minutes of CES between pre and post EEG. There were no significant changes in the controls. Following the CES the patient’s P300 amplitude increased significantly (P<.05). The time went from a pre-treatment of 308 to 317 msec post-treatment. The amplitude (dV) went from pre-treatment of 7.0 to 9.9 post-treatment. Also there were significant positive shifts in alpha, delta, theta and beta spectra in patients who were abnormal in one or more of these areas prior to CES treatment. It was concluded that CES might be a significant non-drug treatment for the underlying electrophysiological disorder of the drug abuser, because the normalization of these electrophysiological parameters are characteristic of pharmaceutical treatment. Research was conducted with 4 groups: (1) “normal group”, (2) intractable chronic pain, (3) chronic pain with depression, and (4) longstanding depression unresponsive to medication. Psychological tests, serotonin and cholinesterase levels were measured pre and post. Depressed patients improved most with treatment; 60% reported improvement, 44% of the pain patients reported improvement. In the depressed patients, after treatment, both serotonin and cholinesterase levels improved significantly. Neuro-Fitness is dedicated to furthering an understanding of CES. It is also committed to engaging in and subsidizing research to demonstrate its efficacy. Studies under our aegis are currently being conducted in the Czech Republic on the impact of CES on ADHD and substance abuse. We are also currently conducting a study at the Pain Center of the University of Washingto in Seattle. We are open to proposals for new research designs and studies by scientists and medical professionals in conjunction with Universities and schools of Medicine. Contact us today to discuss your proposal. … now there is a new way to treat anxiety, insomnia, and depression. How do I know when to stop using the probes? Once there is no additional improvement in pain control after 3-4 treatment sets, you should stop. After the initial three weeks of daily treatments, it is typically best to treat with probes every other day or less, as most people get better results this way. Can you use probes on the head? Yes. Dentists use Alpha-Stim® technology routinely, not only to treat dental anxiety, but also to control orofacial, temporomandibular and postoperative pain using probes or electrodes on the head. People can also use probes in treating a migraine. It is often best to keep the intensity turned down when treating on the head. It is not recommended to treat near the eyes. Using probes on the head may result in seeing the current in the form of flashing lights as the optic nerve converts the signal into light. Also treating around the mouth may cause a metallic taste. I have experienced flashing lights when treating a headache with probes. Why? Close proximity to the nerves governing the optic nerve can stimulate these nerves, causing a stroboscopic effect. This is not cause for concern. The flashing lights will go away when the stimulation is discontinued. I have experienced a metallic taste in my mouth when treating a headache with probes. Why? Close proximity to the nerves governing taste can stimulate these nerves, causing a metallic taste. This is not cause for concern. If the metallic taste persists, rinse your mouth out with water and it will go away. What is the difference between treating with probes vs. self-adhesive electrodes? The current density differs. Ten seconds with the probes equals about 10 minutes with the AS-Trodes™. Most patients prefer treating pain with the AS-Trodes™ because it is easier to apply AS-Trodes™ than treat themselves with the probes. Typically, treatment with probes may require help from a friend. However, the probes are faster to use and less expensive over time than treating with AS-Trodes™. Use of probes is also more practical if hair is present (reapply conducting solution frequently if hair is present). We suggest viewing the instructional DVD that comes with the Alpha-Stim M, the owner’s manual, and treatment protocols for more information. How long should I treat with the AS-Trodes™? How do I know when to stop? For most patients it is sufficient to treat for an hour daily for the first 2-3 weeks, then 3 times weekly or as needed. After the initial period of daily treatments, most patients get better results by treating every other day at most. Some patients with acute pain do need to treat with AS-Trodes™ for up to several hours at a time, particularly initially or for post-surgical pain. When treating pain, how should I deal with body hair? If possible, shave the hair in the area where AS-Trodes™ will be placed. Alternately, the probes may be used instead, and in that case it is not necessary to shave the area but use plenty of the Alpha Conducting fluid and reapply it often, as the hair will wick it away. Using AS-Trodes™ without shaving the hair will shorten the lifespan of the electrodes. treatment for back pain, my back sometimes feels stiff. What can I do about that? Stop treatment for that day. The stiffness will wear off soon. Why does the Alpha-Stim® M come with 3 different frequency settings? For most people, and most conditions, the 0.5Hz frequency setting is best, resulting in longer residual pain relief that the other settings. If you are not achieving optimal results with the 0.5Hz setting please call us for tech support. The other frequency settings may lead to faster pain relief but typically the relief does not last as long. Always use 0.5Hz for earclip treatments. In the USA, any practitioner who is licensed to diagnose and treat depression, anxiety, insomnia, or pain can order or dispense the Alpha-Stim®. This includes MDs, DOs, nurse practitioners, physician assistants, dentists, chiropractors, naturopaths, physical therapists, acupuncturists, psychologists, licensed social workers, and other licensed mental health professionals. Why are my earclips rusting? A discoloration that may occasionally develop on earclips is actually a form of stain, not rust. It is produced as a “byproduct” of a chemical reaction between the current, conducting solution and natural skin residues or oil. This staining, if present, does not affect the efficacy and/or safety of the treatment. The amount of staining reported by patients varies widely among different people, mostly reflecting the amount and type of skin residue and, perhaps, the amount of conducting solution used during treatment. One way to minimize the stain is to clean earclips and replace felt pads immediately after each use to keep the metal of the earclips dry and clean. I cannot feel any current from my AS-Trodes™. What should I do? For most people, the current is subsensory when applied on the body with probes or AS-Trodes™. Thus it is normal to not feel it. Or you may feel a very slight sensation. How long do the AS-Trodes™ last? The AS-Trodes™ may last 2-4 weeks or longer, depending on how often a patient uses the electrodes, for how long, and how clean and dry their skin is when applied. The manufacturer has gone to great lengths to research and procure the best possible electrodes for use with the Alpha-Stim®. The primary concern is efficacy. The adhesive gel on the AS-Trodes™ is the conductive medium ensuring proper contact and distribution of the electrical signal with the body. There are many variables which cause this gel to lose its effectiveness including humidity, amount of hair, oil, or sweat on the skin, and cleanliness of the area where applied. To maximize the lifespan of AS-Trodes™, apply to clean, dry skin and sit or lie down during your treatment. When the gel begins to lose its ability to adhere properly to the skin, it is time to replace the electrodes, and you may order online at www.AlleviaHealth.com. 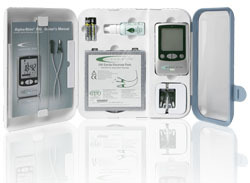 It is more cost effective to order 10+ packs at a time if you continue using electrodes long term. Please use high quality AA or AAA lithium batteries only for optimal performance. Rechargeable batteries do not discharge evenly. The waveform produced by Alpha-Stim technology is very specific and an unstable power supply may alter it thus affecting the results. In addition, the Alpha-Stim requires a well charged battery. Lithium batteries start out with more charge than a rechargeable battery and thus last much longer. Can you use Alpha-Stim® technology with magnet therapy? No. Electrical and magnetic fields interfere with each other so magnets can alter the Alpha-Stim waveform, rendering it ineffective. Can Alpha-Stim® earclips be worn during an MRI procedure? No, that is not recommended. However, it would be beneficial to use CES before MRI, particularly if a patient often experiences procedural anxiety. I am planning on taking my Alpha-Stim with me on a trip next week. Will the airport X-ray machines cause any damage? Should I check it in or carry it through the security? Alpha-Stim technology will not be affected by airport X-ray machines. Feel free to carry it on. If you are concerned security might ask questions about what it is, you may bring a brochure and receipt for the Alpha-Stim. We discourage checking your Alpha-Stim in your luggage to minimize the possibly of theft. What are the side effects of using the Alpha-Stim®? Why should I order my Alpha-Stim from Allevia Health? What is the procedure for ordering an Alpha-Stim? Once you receive my order and Statement of Medical Necessity (Rx), how fast will my Alpha-Stim ship? How does the rent-to-own plan work? I am renting an Alpha-Stim AID and I want to upgrade to the Alpha-Stim M. Can I get credit for my payments on the AID model? If I purchase an Alpha-Stim® outright what is your return policy? What kind of warranty comes with the Alpha-Stim®? I live in another country. How can I purchase an Alpha-Stim®? Description: Class IIa. Type BF medical device generating microcurrent pulses that are thought to reach the brain directly via ear lobe stimulation with 42% reaching the cortex through a perineural or vascular pathway via the auditory meatus. Frequency: 0.5 to 60hz. Output: 4.0 mA maximum. Waveform: Bipolar asymmetric rectangular waves, 500/a duty cycle. 0 net current. Average current density in brain tissue: 1 mA: 5-18 uA per cm. Electric field in brain tissue at 1 mA: 2.8 to 8 mV per cm. Method of Action: Cranial electrostimulation uses microcurrent pulsed high frequency carrier waves (15,000 Hz) which utilizes the bulk capacitance of the body and a modulating bioactive frequency at low current levels to reestablish optimal neurotransmitter levels and functioning in the brain. CES differs from traditional transcutaneous electrical nerve stimulation (TENS) which is low-frequency (200 Hz or less), high-current (hundreds of mA) modality. Low-level electrical current interacts with cell membranes in a manner that produces modifications in information transduction associated with classical second messenger pathways, calcium channels and cyclic AMP. The activity/levels of MAO-B in blood platelets, CSF and plasma serotonin beta endorphin GABA concentration in blood. DHEA, 5-hydroxy-indol-acetic acid and enkephalins were all increased in experimental groups after 20 CES procedures. Cortisol and trvptophane levels decreased. Electrical engineering studies found that a small fraction of CES current actually reaches the thalamic area of the brain facilitating the release of neurotransmitters as noted above. A decrease in the latency of alpha-rhythm appearance at sleep onset has also been recorded with CES use evidencing reduced rigidity in the CNS stimulation process and enhanced activity of the alpha-rhythm generating systems. Indications and Usage: In carefully conducted randomized controlled trials CES has repeatedly shown efficacy in treating mild to moderate primary or secondary anxiety and depressive conditions, normalization of central hemodynamics (systolic and diastolic blood pressure but not peripheral vascular tension) in Stage I hypertension, relieving headache pain (85%) and other types of pain conditions including pain resulting from dental surgery and cancer (35%), and especially in potentiating through centrally-mediated action the effect of analgesic drugs (fentanyl 176%-306%, morphine 174%-306%, alfentanil I 60%-2 15% and dextromoramide 267%-392%), or replacing them altogether and increasing the depth of anesthesia (In one study fentanyl use decreased by 31%.). and increasing attention and the ability to learn new tasks. To a lesser degree CES has been shown effective in relieving primary insomnia (particularly sleep-onset insomnia), mild depression, post-axonic spasticity, minimal brain dysfunction and mood changes subsequent to closed head injury (with corresponding decrease in the need to neuroleptic drugs). Efficacy of CES has been researched in regards to substance abuse recovery (including nicotine and opiate addiction) with mixed results. Contraindications: Do not use this product if you are pregnant or lactating without first seeking advice from your physician. Do no use if you have a cardiac pacemaker (particularly demand type pacemakers) or other implanted bioelectric equipment without first consulting your physician. There have been isolated reports of CES treatment lowering blood pressure so care should be taken while using CES in conjunction with high blood pressure medication. After you have received initial instructions and a practice session on the CES unit with your therapist you will be able to self-administer treatment in the waiting room during hours when our office is open and a doctor is present. You will find the CES unit in the white case beside the couch in the waiting room. Here are your general instructions for use of the CES unit. PRECAUTIONS: Optimally CES treatment should be applied in early hours after awakening and while in relaxed and quiet environment. Do not use CES within three hours of bedtime. Exercise caution when driving or operating machinery for one hour after treatment. Do not apply electrodes directly over the eyes or the carotid sinus area (upper side of the neck below the ear and behind the jaw). Do not sleep during CES treatment. SETTING UP THE CES UNIT: Check settings by making sure “CH1” switch is set at “0.5 Hz”. “CH2” should be set at “CH1” position. “Intensity” should be set at “0” when unit is first turned on. The CES unit will have soft felt pads on each of the ear clips. Tear open one of the alcohol wipe packets and use the wipe on both of your ear lobes. Then put a few drops of saline nasal spray on each of the felt pads and place the clips just like earrings on your left and right ear lobes. TO BEGIN THE CES TREATMENT SESSION: Once you are all ready to begin. Depress the “Power” button once and the countdown timer at the top on the CES unit will begin to count down from 30-minutes. Get into a relaxed position and begin to gradually turn up the “CH1 Intensity” level (green dial on upper left-hand side of unit) to highest comfortable level. This is usually the point at which the tingling or pulsing feeling on your earlobes begins to become uncomfortable and generally in the 2 Hz range. (Do not go but not go above level S on the dial.) The pulsing feeling that many people experience in their earlobes is normal and means the machine is working correctly. There is no way that the CES unit can be harmful to you so you can relax and enjoy the session. It is fine to read, mediate, and listen to music or just rest. Try not to fall asleep during the CES session, but it will not hurt you to do so. if you have arranged double 60 minute session simply set the CES unit timer accordingly or turn the “Power” button off and back on again after each 20 minute session. FREQUENCY AND DURATION: Optimal CES treatments are 30 minutes two times daily for the first three weeks but one 60 minute session may be substituted. In some studies 40 minutes I time per day, five days per week has been found to be adequate. After first two weeks of daily treatment application may be reduced to maintenance level ranging from one 20-minute application every other day to one 20-minute application every three days. Treatment should not be discontinued as ineffective until 2 weeks of twice daily applications have been completed. FOLLOWING CES TREATMENT: Use caution in operating a motor vehicle or other potentially dangerous mercenary until you get used to how you feel after CES treatment. We suggest you take it easy and avoid stressful situation for at least an hour after CES treatment. Try and move slowly, taking your time and breathing calmly and deeply into your abdomen. We also suggest you drink at least 2 full glasses of water in the first hour after CES treatment. Make a note of any unusual or interesting phenomena you experience and discuss these with your doctor at your next session or before is necessary. COMBINED USE WITH MEDICATIONS: Cranial Electric Stimulation can be used in conjunction with analgesic, psychoactive and vascular medications. In general CES tends to potentiate, or cause an increase in, the effectiveness of these medications. Medication dosage should thus be closely monitored and reduced is necessary. The following technical information about the CES can be shared with your prescribing physician who may also request copies of research articles from our office. Medication for high blood pressure should be monitored carefully as it may need to be reduced. SPECIALIZED TREATMENT NOTES: Anxiety: CES can be used on a preventive and, or emergent basis. Insomnia: Reduced frequency of treatment needed (20 minutes once daily tapering after two weeks to 3 treatments weekly). Optimal treatment time during circadian rise immediately preceding sleep (e.g. 4-7 p.m. if bedtime 10:00 p.m.) Primary treatment affect is in Stage 4 (delta) sleep. Ambiguous REM occasionally occurs during treatment Headache Treat headache as soon as possible after first warning signs and not later than one hour after onset. Patch electrodes should be placed on alternate sides of temple. Can be used in conjunction with analgesic and vascular medications. Clinical Effect In: Response to CES treatment is very individual. Treatment effects tend to be cumulative. Relief for anxiety conditions, insomnia and attentional problem is normally experienced by the second treatment with stable recovery by the seventh treatment. Mild depression and mild chronic pain conditions generally remit by the end of the tenth day of treatment. When brain neurotransmitters are back in balance no further improvement will be noticed. Maintenance treatments are sometimes needed at 2 to 3 twenty-minute sessions per week. Adverse Reactions: Generally well tolerated. Some persons may experience initial anxiety related to novelty of the CES procedure and, or pulsating feeling generated by electrodes against the skin. Other adverse reactions: Dizziness (0.15%), skin irritation (0.12%), headaches (0.22%). Rare paradoxical reactions such as hyperexcited states, increased anxiety, and sleep disturbance have occurred. Some CES studies have demonstrated a exacerbation of preexisting depression in some individuals. No impairment of consciousness or reaction time has been reported in clinical studies. No studies have been conducted on long-term use of this product. If you suspect that an herb or other supplement is making you sick, call the FDA’s MedWatch hotline at 800-332-1088 or contact the agency via it’s website at www.fda.gov/medwatch. Known Interactive Effects: CES treatment may interact with over-the-counter, herbal, hormonal, or enzymatic medications prescribed for the treatment of psychological conditions including anxiety, depression, or insomnia including drugs which affect brain serotonin levels or for pain and other neurologic conditions. In such situations close supervision by psychological or medical personnel is recommended. Warnings: The information above is provided for educational purposes and may not be construed as a medical prescription or as a substitute for the advice of your physician. Do not use this product without first consulting your physician especially if you are pregnant or lactating. You should regularly consult your physician in matters regarding your health and particularly in respect to symptoms and conditions which may require diagnosis or medical attention. Reevaluate use of this product after 6 months. Q. What is the history of CES? A. At least two millennium ago, physicians used electric eels to relieve pain. Experimentation with low intensity electrical stimulation of the brain was first reported by Drs. Leduc and Rouxeau of France in 1902. Research on using what is now referred to as cranial electrotherapy stimulation (CES) for treatment of anxiety began in the Soviet Union during the 1950’s, its primary focus being the treatment of sleep disorders, hence its initial designation as “electrosleep.” Treatment of insomnia was soon overshadowed, however, by psychiatric application for depression and anxiety. Since then, it has been referred to by many other names, the most popular being transcranial electrotherapy (TCET) and neuroelectric therapy (NET). East European nations soon picked up CES as a treatment modality and its use spread worldwide. by the late 1960’s, animal studies of CES had begun in the United States at the University of Tennessee and what is now the University of Wisconsin Medical school. These were soon followed by human clinical trials at the University of Texas Medical school in San Antonio and the University of Wisconsin Medical School. More studies have followed. At present, the number of human studies stands at 103. In addition, there are 18 experimental animal studies, all of which attest to the safety of CES. CES has been an international treatment modality for more than 50 years. Thousands of people worldwide continue to receive its benefits. The most extensive work on CES continues in Russia at the Pavlov Institute in St. Petersburg. But by no means is its use restricted to that part of the world. Current estimates are that there are between 50- 100,000 units in use globally. From a broad reading of published literature, no negative effects or major contraindications have been found from the use of CES to date, either in the U.S. or other parts of the world. Q. Who could benefit most from the use of CES? A. First and foremost, those suffering from stress in the form of depression, anxiety, and insomnia who seek an effective non- pharmacologic alternative. Secondly, those suffering from illnesses where stress constitutes a prime symptom. It has been estimated that 80% of the populace of the United States react to life adjustment problems with the “flight” or “fight” anxiety reaction. And that a similar percentage of our hospitals are filled with persons who have channeled anxiety released energies into their bodies resulting in psychogenic illnesses. We would underscore, however, that CES is not a cure for these illnesses and does not represent itself as such. But by successfully addressing the anxiety, depression, and insomnia underlying these disorders, it can play a major role in the healing process. A. You don’t have to be “sick” or “stressed-out” to use CES and realize its benefits. CES is a life-enhancing instrument of potential value to everyone. Its uses are wide ranging. Some people use it as an adjunct to meditation practice each morning. Others during peak stressor moments that hit unexpectedly in the course of a day. Who hasn’t experienced those times when we are about to “lose it?” Putting the unit on in these situations even just briefly–perhaps for as little as ten minutes– can help curb that anxiety and serve as a reminder that one needs to be with ones self in a different way. CES also represents a significant affirmation that you have the power within to change your mental state and that you are willing to take active steps to create the time and the space to do so. Q. Can CES be used as a sleep aid? A. The 100 Hz CES unit can be used at bedtime. But the .5 Hz CES needs to be employed differently. Because of the increased alertness resulting almost immediately from its use, some patients may find it difficult to fall asleep immediately after a treatment. Accordingly it is recommended that the .5 Hz CES application be done at least three hours before going to bed. But by no means does that mean that it is contraindicated for insomnia. One thing CES users often report is an increase in vivid dreaming. This results from compensation for lost REM sleep. As your sleep pattern begins to normalize–within the next two or three nights–it should become less frequent. Q. Does CES work for everyone? A. No. But it is known to be significantly effective for about 95% of the people who use it. Q. What can I expect ? A. Most people will experience a relaxation response almost immediately after treatment begins with a CES unit. Immediately after a CES treatment, patients usually report feeling relaxed and sometimes inebriated for the first few minutes. This is a pleasant and very comfortable sensation. After several minutes to hours, the light-headed feelings usually disappear, the relaxed state remains and a profound sense of alertness is achieved. This relaxed/alert state will usually remain for an average of 12 to 72 hours after the first few treatments. With regular use it is possible for the patient to habituate to this preferred state of consciousness. Some patients describe the CES experience as analogous to having a type A mind in a type B body. During the treatment some people will notice a subjective change in their body weight. You might feel heavier at first and then lighter, or you may simply feel lighter initially. You could feel slightly worse during the heavy cycle, and this feeling could last for days unless extra treatment time is given. Therefore it is important to continue the treatment for a few extra minutes if you should feel heavier at the end of the allotted time, even if it has already been twenty minutes or more. Continue for at least two minutes after you feel lighter. Although this is quite common, not everyone will be aware of these weight perception changes. Q. What long range changes should I expect? A. Sleep patterns should begin to normalize within the first day or two, with less and shorter periods of awakening during the night, faster onset of sleep after going to bed, and a greater feeling of being rested upon awakening the following morning. Depression and mood swings become less, as does irrational anger, irritability, and poor impulse control. By the second week, cognitive processing is visibly enhanced. Mental confusion due to stress begins to subside as the ability to focus and concentrate on work becomes easier and more efficient. The ability to recall information and accelerate learning also begins to return to normal pre-stress levels as concentration and memory improve. Q. What is the suggested length and frequency of treatment? A. For the 100Hz unit the recommended usage is 30-45 minutes once or twice daily for the first month after which the frequency may be reduced to two or three times weekly once symptoms are reduced or eliminated entirely. The 0.5 Hz unit recommended usage is three times a week for twenty to forty minutes, although there are some who will benefit from a more frequent daily treatment. There are also some who will achieve the full benefits within ten minutes. Some dentists use it instead of nitrous oxide during dental procedures that last for hours .You yourself determine how to best incorporate CES into your daily routine. It can be used on waking in the morning and/or on going to bed at night and/or in response to stress situations. Individuals undergoing psychiatric treatment or rehabilitation for substance abuse often benefit from more frequent and prolonged application. Those suffering from severe anxiety and extremes of compulsive or addictive behavior may find it necessary to use it more frequently, perhaps several times daily. When symptoms of depression or anxiety have lessened or disappeared, it is still important to have access to the unit as a tool for relapse prevention on an as-needed basis. It is helpful to work in close conjunction with your physician/healthcare professional to determine the role CES plays in your overall treatment program. Q. Can you overuse the unit? / Are there any adverse effects from doing so? A. You can’t really overuse it. There have been no reported adverse effects from more frequent use. The objective of CES is to return neurotransmitter activity to pre-stress homeostasis. Once attained, CES has no additional effect. Serving as a training wheels of sorts, CES helps you reprogram yourself. Rather than learning to rely on the unit, you learn instead how to refine and expand the art of self-regulation. CES teaches you to become more sensitively attuned to yourself and better understand your body and its needs. Along the way, you will intuitively come to know when CES is needed and when it is to be put aside. You alone will become the determinant of use, as regards both frequency and duration. During its usage, you will experience periods of relative calm and a sense of control. You may even succumb to a bit of self- congratulations. Seemingly, your CES unit appears destined for the bottom of a drawer. Life being what it is, however, just as you are ready to celebrate for successfully negotiating your personal terrain with skill and dignity— Voila! New challenges appear from nowhere,–a veritable curveball from Hell. CES can help move you through those difficult transitions. Keep it handy. Incorporate it into your daily regimen. The continuing use of the unit allows for further refinement of stress management skills at newer and higher levels of complexity. Q. Is CES difficult to use? /How much technical skill does it take? A. Most CES units are user friendly. After having put on either the electrodes or the earclips and inserted the leadwire into the jack, it’s all very simple. CES units either feature an on-off knob that also controls the amplitude (turning it to the right increases the amount of current) as in the 100 Hz devices. They use a button that turns the unit on and a side wheel that increases the amplitude (The Alpha Stim in addition displays the amount of micro-current being used from 1-6, each numeral representing one hundred microamperes). Start with a low current and gradually increase it. If the current is too high, the patient may experience a stinging at the electrodes, dizziness or nausea. If any of these symptoms occur, simply reduce the current and the symptoms will immediately subside. After a minute or two, try increasing the current again, but always keep it at a comfortable level. It’s ok to feel the current providing it is not uncomfortable. Q. How does CES work? A. As is the case with numerous medications, including aspirin, the exact physiological mechanism by which CES works is not fully understood and is still the subject of research study. It is hypothesized that CES acts by direct stimulation of the brain in the hypothalmic area with specific electronic frequencies. Such stimulation causes the brain to manufacture various neurohormones that effect ones moods and emotions as well as ones cognitive capabilities back to a level of pre-stress homeostasis. For a more detailed hypothesis see “The Biolectrical Mechanism” under Research. Q. How does electromedicine such as CES differ from Western drug medicine? A. Western drug medicine relies primarily on chemistry to heal and control pain. Microcurrent electrical therapy (MET) is based on the concept that the biophysics underlying the chemistry also plays a significant role in regulating bodily processes. Using waveforms at a level of current similar to the body’s own, MET bridges cellular communications helping reestablish the normal electrical flow. The concept of a bioelectrical control system is common to every form of healing ever developed in recorded history, except for drug medicine. The Chinese named bioelectricity chi; the Japanese called it ki, the Indians referred to it as prana, and the Russians, bioplasma. There are 75 trillion cells in the human body, each one having an electrical potential across its cell membrane, just like a battery. Though acknowledging this fact, Western medicine does not yet fully appreciate the natural healing powers of the body or the bioelectrical systems that control them. .
Q. How is the current transmitted? A. The traditional 100Hz unit utilizes pre-gelled electrodes that snap on or attach to the end of leadwire that plugs into jack of the unit. The Brain Tuner (BT-5 and 6) employs a stethoscope shaped device that sits beneath the ears. The 0.5 Hz unit (Alpha Stim) uses “ear clips” with felt electrodes that adhere to the clips. Saturate the felt electrodes with saline solution and then apply them to the superior aspect of the earlobes as close to the jaw as possible. Q. Under what circumstances is CES best used? A. CES units generally come with a built-in belt-clip allowing you full freedom of movement. This allows you to use it just about anywhere and under a variety of circumstances, except those noted under the contraindications. You can do it at home while watching TV or at the office while doing your paperwork. Though of course you might not care to go out jogging with it on, but then again you might. But CES is more than an aside. It is also a reminder of the need to create inner quiet and reroute your mental traffic. You don’t want to contribute to it further by treating CES as yet one more thing to do, squeezed in between other frenetic events in your life. Though you need not interrupt your usual activity for CES, its results are generally enhanced by setting aside a special time for its use alone. Q. How safe is CES? A. CES has an unblemished safety record. For a more detailed analysis of that record see “safety” under the research section. Cranial electrotherapy stimulators are generally limited to less than one milliampere (mA) of current. The Alpha-Stim 100 is an example of a CES device that employs very low intensity electrical current pulses (up to 600 microamperes). To put this into perspective, it takes one-half of an ampere to light an ordinary 60 watt light bulb. To truly compare the work done per second by these two different currents, we must multiply the currents by the respective voltages that drive them. The product current x voltage is a measure of the rate of generation of energy, and is referred to as the power output. By definition, when a device outputs 1 ampere of current with a 1 volt driving force, the power output of the device is 1 watt. Therefore for the Alpha-Stim 100, the maximum output is (600/1,000,000)amperes x 9 volts = 0.0054 watts, or about 11,000 times less power than the light bulb. Many people do not even feel this amount of current. This is current amplitude similar to that in the human body. The sole source of the current is a nine volt battery. Because the current is alternating, it sends bipolar current between the electrodes instead of unidirectionally, as would be the case with direct current. Hence there is a net cellular polarization of zero to the user. This is a safety factor of major importance. The Alpha-Stim in particular uses a very broad band of frequencies collectively known as harmonic resonance. This insures that the right frequency will be delivered to reestablish homeostasis within the bioelectrical system. The other frequencies pass harmlessly. A. CES is not to be confused with either ECT (electroconvulsive therapy) which uses a much greater amount of electricity to induce traumatic shock, or aversion therapy both of which are based on discomfort. With CES you should experience no discomfort whatsoever. The most that will ever be felt is a mild tingling sensation. If at any time the sensation proves too strong, the amplitude should immediately be reduced by a simple turnoff the knob or twist of the dial. Research shows CES to operate effectively at both lower and higher levels of stimulation as well as below the sensate threshold. accordingly, the patients may turn the amplitude to the point of sensation; then turn it down slightly below that point leaving it there during the session. You may also increase or decrease the amplitude at will without impairing the efficacy of the treatment. Your own comfort always dictates the setting of the treatment. Q. What is the relationship between CES and nutrition? A. There is a synergistic relationship between nutrients and CES. Think of the brain as a car battery, some cells of which may not be fully functioning. To achieve that end one needs both water and the trickle charge–This is analogous to the brain, amino acids and the CES. The brain uses amino acids as the raw materials, the building blocks or precursors with which to build its neurotransmitters. It is necessary for these amino acids to be present in the bloodstream in adequate amounts for the maximum impact/benefit of CES to be realized. These precursors, if present will be taken up and synthesized into neurohormones much more effectively when CES is added. These neurotransmitter precursor amino acids can be taken orally as food supplements. To experience an even more dramatic impact of CES, it should be done in conjunction with amino acid supplements, especially in those areas in which one is deficient. Ideally, you might first test to determine the nature of the neurotransmitter deficiency and then develop a regimen supplementing your diet with specific amino acids known to be precursors to them. A. There are no known contraindications for use of CES. However, there are circumstances in which its safety has not been tested. Accordingly, CES should not be used without on-going clinical supervision by severe depressives and those known to be epileptic, pregnant, or those using implanted electronic devices such as cardiac pacemakers or insulin pumps. There have, however, been instances where under such supervision CES has been employed successfully and where CES has been shown to reduce both the frequency and severity of seizures. Because of the feeling of induced relaxation that results while using CES, though, this relaxation response does not in any way impair reaction time, it is recommended that CES not be used while operating dangerous or complex equipment or while driving. CES treatment may result indirectly in increased blood flow to the brain. Hence its possible contraindication in recent hemorrhagic stroke patients. This same effect can cause brief increased blood flow beneath the electrodes behind the ears. This redness should not be cause for concern. This is an extremely rare occurrence. It is not a burn response and will go away shortly after the CES treatment is finished if it occurs at all. Perhaps three persons out of one hundred report a slight headache when using CES. This is usually alleviated by simply turning the current down. If the headache should recur during ordinary use, cease using the unit and consult with your health care professional. As with the use of any medical device, the physician/licensed practitioner should be informed of any medication or neurotransmitter blockers the patient is taking as well as the employment of cardiac pacemakers or other electronic devices as mentioned above. Q. What research is there as to the safety and effectiveness of CES? A. There are approximately 1,000 articles on CES therapy many of which are listed in four reviews put out by the Foreign Service Bulletin of the United States Library of Congress. This is in addition to the wealth of physiological and bio-engineering data on electrosleep and electroanesthesia in animals. As of this writing there are more than 100 research studies on CES in humans and 18 experimental animal studies. The efficacy of CES has been clinically confirmed through the use of 28 different psychometric tests. The significance of CES research for treating anxiety has also been reconfirmed through meta-analyses conducted at the University of Tulsa and at the Department of Health Policy and Management , Harvard University School of Public Health. The full body of research can be accessed at this website.